Hi, my name is Liz. I am 30 years old. I grew up in a little beach town in Southern Massachusetts. In high school I focused more on my studies and after-school job than playing sports or being active. I moved to Arizona when I graduated, originally planning to earn my degree in Psychology. My interest in nutrition led me to change my major to Dietetics. While I was in my undergrad program and working at a hospital, I started personal training as a hobby. I ended up loving it, and started CORE by Liz. 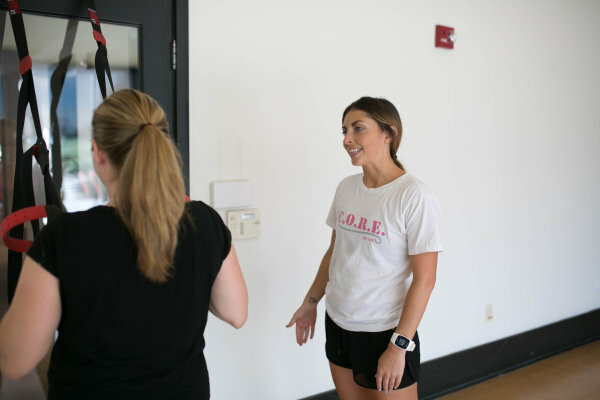 I went on to study Obesity Prevention and Management in grad school and have now helped hundreds of women gain confidence in the gym, in the kitchen, and in their everyday lives. I specialize in women's fitness, obesity prevention and management, and nutrition coaching. Working out with Liz has made a tremendous change in not only my life but also in my dress size! Liz has shown me that I am really stronger than I thought I was mentally and physically! Liz has taught me how to work out according to my age and body type. She has also taught me to eat correctly and incorporate a more healthy diet into my busy lifestyle. Ever since Liz has started training me I have gone down 4 pants sizes! I couldn’t be happier! "I've been effortlessly skinny throughout most of my life. I've eaten healthy and performed minimal physical activities, but always for fun and not for fitness (e.g., yoga, hiking, basketball). Three years into our relationship, my boyfriend playfully pointed out that I had put on "comfort weight" since we began dating. He thought it was cute. I was mortified. I wanted to take back my slim body, but with minimal experience exercising or dieting and relatively new to the vegetarian lifestyle, I didn't know where to begin. I wanted professional guidance on what exercises I should perform, and how to do them properly. I wanted to work with a nutritionist (and preferably one with first-hand experience as a vegetarian) to learn which plant-based proteins would fuel my workouts and help me build lean muscle. When I called up Liz, I made the decision to invest in myself. That was one of the best things I have ever done for myself!! Not only Liz extremely knowledgeable, but also fun, upbeat and incredibly supportive! She designed a customized 16-week workout program to meet my current fitness level, with regressions, progressions and helpful tips. Liz helped me create a personalized and responsive dietary plan and sent me healthy, new recipes throughout the program. Between the weekly sessions with Liz and my prescribed at-home workout program, I push myself to new limits each day. In 16 weeks, I have learned how to leverage my own body weight and use standard gym equipment--today, I can take fitness anywhere I go. I may not be as skinny as I was in my early 20's, but I feel stronger, healthier and prouder of the body I am working hard to create each day! Thanks Liz!! I'm looking forward to continuing to work with you! :)"